Broadway veteran, Elaine Stritch, opened the musical proceedings with a sassy rendition of “Broadway Baby,” from Follies. Miss Stritch, working her octogenarian status for all it’s worth, was amusingly tentative at song’s outset. But it did not take her long to kick things into a jazzy and fun-filled red-hot-mama gear, and even if there were a few moments that were vocally shrill, she radiated a joyful glow that paralleled the glow of the electric-blue lighting that outlined the stage. We should all project that much energy when we are in our eighties. Next came a total change of pace (and age) that was perhaps aimed at pleasing the First Daughters, Sasha and Malia, as they accompanied the President and First Lady at the performance. 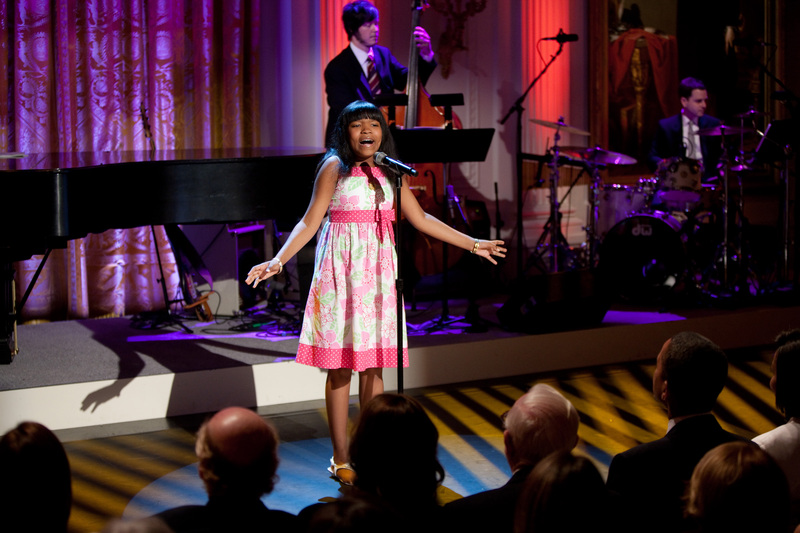 Twelve year-old Assata Alston was a pint-sized powerhouse as she delivered the song, “Gimme Gimme,” from Thoroughly Modern Millie. 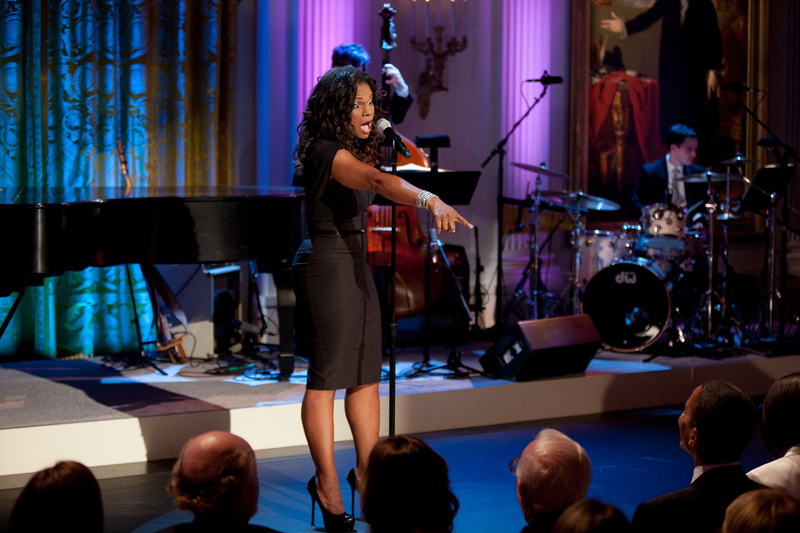 Brian d’Arcy James (Broadway’s Shrek) dared to follow that act as he offered an up beat rendition of Irving Berlin’s, “Blue Skies.” Musical Director, Rob Berman, and his quartet would accompany all of the evening’s musical numbers. Providing more musical fun, Karen Olivo (along with fellow cast members of Broadway’s current revival of West Side Story) brightened the evening with the spirited choreography, brightly colored dresses, and fiery rhythms of the classic, “America.” Broadway’s brilliant Audra McDonald followed with her performance of Frank Loesser’s frantic tongue twister, “I Can’t Stop Talking About Him.” While the number is a clear demonstration of rapid-fire articulation, it seemed an odd choice to display the beautiful voice that once swept me away in Lincoln Center’s memorable revival of Rodgers and Hammerstein’s Carousel. Happily, McDonald returned later in the program with a much better showcase of her soaring voice in, “Happiness is a Thing Called Joe,” from Cabin in the Sky. Some might prefer the simpler and more direct version of a Judy Garland to this fairly ornate and complex interpretation, but McDonald still makes the song her own. Next up was Tony Award nominee, Chad Kimball, singing the title song from perhaps my favorite musical of last season, Memphis. His was a heartfelt performance, but somehow the song seemed to lose its impact when taken out of the context of the show itself. Then, singing “Gonna Pass Me a Law,” attractive Tonya Pinkins took to the stage as Caroline (Caroline, or Change) with the wandering and dreamy longings of a black maid in 1963 Louisiana during the civil rights movement. Dressed in a shimmering ink-blue satin gown that was perhaps surprisingly revealing for such an occasion, Pinkins revealed a rich and sultry voice as well, in this poignant song that describes what struggling Caroline would do if she were president. 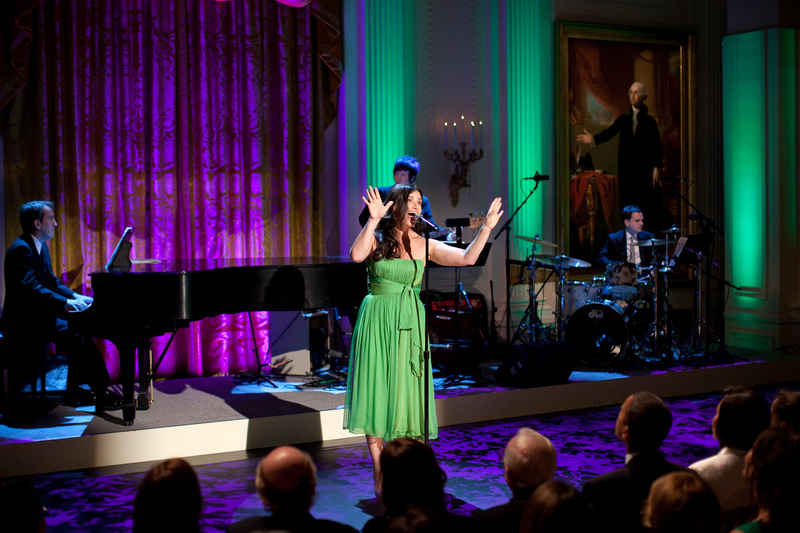 Popular Idina Menzel (Broadway’s Wicked, TV’s Glee) performed the soaring “Defying Gravity,” that helped her win a Tony Award as Elphaba in Wicked, and the East Room audience roared its approval. There followed some minimally humorous interplay between Mr. Lane and Mr. d’Arcy James during their duet of the very forgettable “Free,” from A Funny Thing Happened on the Way to the Forum, but I can assure you no one left the White House humming that tune. With composer, Marvin Hamlisch, accompanying her on the piano, Miss Menzel sang his very beautiful composition, “What I Did For Love,” but I could not help feeling she was working too hard to needlessly embellish the basic musical purity of this classic from A Chorus Line. Then it was time for the return of that Broadway Baby, the feisty Miss Stritch. Offering what could certainly be considered a signature song for her, she let loose with comic flair for the Follies tune, “I’m Still Here,” and proceeded to knock the ball right out of the park. The thunderous cheers and applause could have ended the evening right there, but one last surprise awaited the crowd. Performers Danielle Arci and Constantine Rousouli joined the youth ensemble from Joy of Motion Dance Center, and the Duke Ellington School of the Arts, for the truly joyful, “You Can’t Stop the Beat,” from Hairspray. Now that was a tune that many must have hummed on the way home. “A Broadway Celebration” will be nationally telecast on PBS channels from coast to coast at 9 pm (ET) on Wednesday October 20, 2010. This entry was posted in Concert Reviews, Greater Houston Weekly Columns, Theater Reviews and tagged Entertainment, Reviews. Bookmark the permalink. You must have been thrilled to share such a great night at the White House with our terrific President! You sure are talented and lucky. Thanks for letting us know about the next fabulous PBS show. Can I have a front row seat?